It is raining trouble for Air India's Dreamliner fleet as one of the aircraft was forced to return to New Delhi on Thursday after developing a windshield crack mid-air on its way to Kolkata. Dubai following a snag in its spoilers, which are plates on the top surface of a wing that can reduce the lift of an aircraft. In today's incident, the aircraft, operating flight AI-020 from Delhi to Kolkata, returned to Delhi after its windshield cracked while it was flying over Lucknow. The passengers were later flown to Kolkata on a Boeing 777-300, airline sources said. Although there are several layers in an aircraft's windshield and the cracks occur mostly on the outer one, which does not affect flight safety, the pilots decided to return after the incident, they said. Such cracks occur either due to uneven heating or an object hitting it. There have been several incidents of windshield cracking in Air India's Dreamliner fleet in the past months, even causing planes to be grounded in Paris, Sydney and Frankfurt. In the case of the aircraft grounded in Seoul, they said it would be tomorrow inspected by engineers of the engine manufacturer, GE, before it is given the signal to fly. The engineers were being flown to Seoul from US. About 240 Air India passengers, who were stranded in the South Korean capital, have been flown back to India by other airlines. This Dreamliner was operating in the Delhi-Hong Kong-Seoul sector and the airline had to cancel the return leg of the flight. The decision on the Seoul grounding was a precautionary measure taken after the US Federal Aviation Administration found that a particular series of GE's GenX-1B67 engines had a problem in their gear box, as experienced by the Dreamliner of another global airline. While Air India's entire current fleet of 16 Dreamliners has the same engine, the national carrier has three engines of this particular series, including two in the plane now grounded in Seoul. 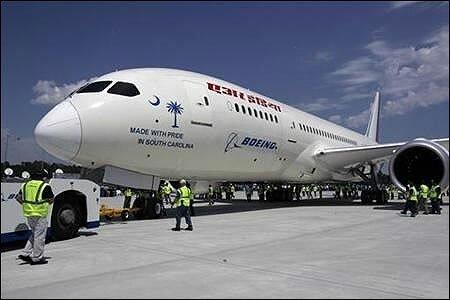 Will Air India buy more Boeing 787 Dreamliners?